This multi-bubbler cast aluminum drinking fountain features three bubbler heads locked to main bowl to prevent against vandals and provide efficient water flow in high traffic areas. Using patented stainless steel, push button activated, valve assemblies allows for front access stream adjustments as well as cartridge and strainer access. Wall mounted design allows the drinking fountain to be placed securely in multiple locations without taking up excess space. 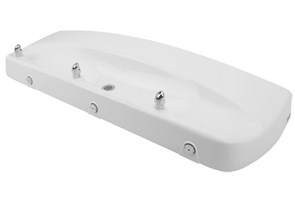 White powder-coated cast aluminum construction mixes just the right amount of durability and appeal in a efficiently functioning fountain. Maintenance is easy and the soft rounded corners prevent mishaps from occurring. Easy Access to Valve and Cartridge.